Aim is to make the best 5 card hand out of 7 cards, 2 dealt to the player and 5 shared by all players. Texas Hold em Poker is the most popular form of poker around and attracts thousands of poker players on online poker sites each day. It is also the game played in most major tournaments held around the world such as the World Series of Poker Main Event and also on Poker TV shows. This is largely the reason that it is the most widely played poker game. We highly recommend that if you are new to poker then you start by learning the rules of Texas Holdem before you try to learn any other forms of poker. It is a great game to get a grounding in and a lot of the principles of good play you learn from Texas Hold em can be transferred across to other variants of poker. 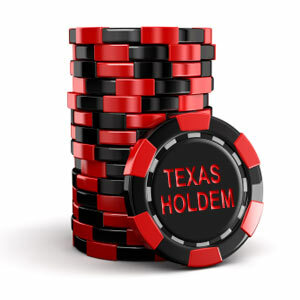 Texas Holdem can be played for a wide variety of stakes and also in No Limit, Limit or Pot Limit format. The most common is No Limit but for more detail on limits and how this affects the betting rules please read our guide to Poker Stakes & Betting Limits. So… How do you play Texas Hold em Poker? In Texas Holdem each player will receive two cards which can only be used by the individual player and there will be five community cards that will be dealt face up on the table and shared amongst all the players (commonly referred to as the “board”). The player with the best possible 5 card hand from the 7 cards available (two in the player’s hand and the five community cards). To see which are the best poker hands you can view a guide to the poker hand rankings here. A Texas Holdem poker hand starts off with the placement of the “Dealer Button”. 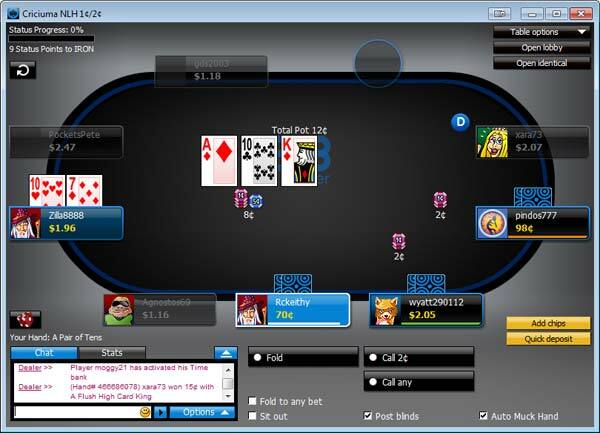 Once the dealer button has been placed in front of the correct player then the two players immediately to the left of the dealer button must place “Blind Bets” into the pot. 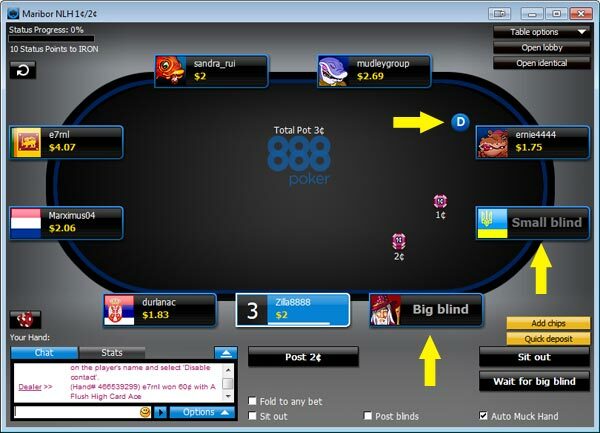 The first player to the left of the dealer button puts in the “small blind” and the player to his left (second left to the dealer) must put in the “big blind“. The size of the blinds are determined by the stakes that are being played. The stakes at a table will be referred to with two numbers, for example $0.25 / $0.50. In this example the small blind would be $0.25 and the big blind would be ….. you guessed it ….. $0.50. The big blind is usually approximately double the amount of chips than the small blind. As the dealer button moves to the left and goes around the table at the end of each hand, every one sat at the table will take a turn in putting forward the blinds. Now the dealer button has been placed and the correct players have placed their blinds into the pot then we are ready to start to deal the cards. 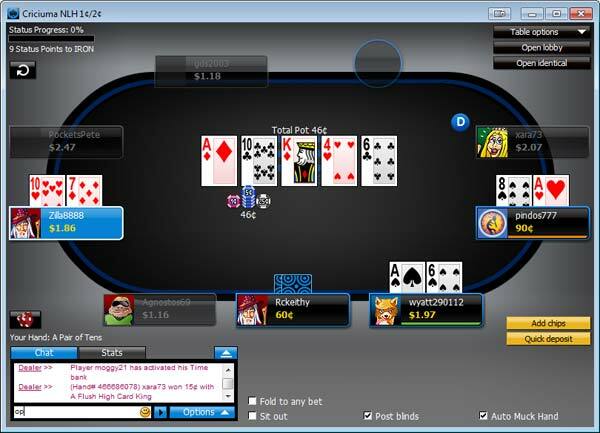 The dealer uses the dealer button as a reference and starts dealing clockwise from the player to the left of the dealer button. So the dealer will deal to the small blind first and the player on the dealer button last. The dealer will deal each player 2 cards face down. This means that only that player will be able to look at the cards and the other players won’t know what they are. In poker terms these are called the “hole cards”. Once everyone has their hole cards the first round of betting will commence. The player to the left of the dealer button will always be the first player to act. As the small blind and big blind have already placed a blind bet into the pot the first round of betting starts with the player to the left of the big blind. “Fold” your cards – you have looked at your cards and you do not wish to play this hand. You will be out of play until the next hand is dealt. “Call” the current bet – If you wish to play in the hand then you must match the current bet which will be the big blind unless somebody acting before you has already raised it to a increased amount. “Raise” the current bet – You may raise the current bet to a higher amount. When you raise anyone that wants to play the hand must now call the increased amount. Each player will take their turn in deciding how they wish to act until everybody left in the hand has put forward the same amount of chips.This includes the small and big blind who will also be given the choice of the 3 options above once everybody else has acted. The minimum you can raise is always the size of the previous bet or raise. Lets look at a couple of examples. If the current bet is just the big blind of $0.50 then the minimum raise would be to a total of $1, $0.50 current bet + $0.50 (the size of the previous bet or raise). A player raises to a total bet of $1.50. Before that player’s raise the big blind was $0.50, so he called the big blind of $0.50 and then raised by a further $1.00 to a total of $1.50. If you then wanted to re-raise again then the minimum that you could raise would be the size of the previous raise – which in this case is $1.00. So you would have to call his total bet of $1.50 and then raise a further $1.00 or more. So the minimum total bet would be $2.50. Don’t worry it’s not as complicated as it first appears and online poker sites will do all the calculations for you anyhow and only present you with the option to raise to the minimum allowed. Once the first round of betting has been completed the first three community cards are dealt face up in the middle of the table for all to see. These first three cards are called “The Flop”. Community cards (sometimes also called “The Board”) are dealt face up for all players to see in the middle of the table. They are shared cards and can be used by all players as part of their hand. Again the player to the left of the dealer button will always be the first player to act. No one has yet put a bet into the pot on the second round of betting so the first player to act will be the small blind. “Check” – the current bet is zero as no one has yet placed a bet in the second round of betting, so this is the free option which allows you to continue to play the hand but not place a bet. When a player checks the action is moved onto the next player. If all players in the hand check, then nobody has to put any more chips into the pot and the action then moves onto the next stage. “Bet” – You can be the first person to make a bet. Each player will take their turn in deciding how they wish to act until everybody left in the hand has put forward the same amount of chips. The fourth community card is then dealt face up and this card is called the “Turn” card (or sometimes called “fourth street”). After the turn card has been dealt then the third round of betting will start in exactly the same way as the second round of betting. The “River” card (or sometimes called “fifth street”) is the fifth and final community card that is dealt face up. Once this card is dealt each player will know what their best five card hand is based on the seven cards they have to choose from. A final round of betting starts following the same rules as the second and third round of betting. If there are still more than one player remaining in the hand after the final round of betting then this means they have all put in exactly the same amount of chips. The “Showdown” now takes place to determine who has the best hand and who wins the money collected from all players during the hand (the “Pot”). All players remaining must reveal both hole cards at this point to determine who is the winner. In the event of a tie, the pot is split between all winning players equally. After the showdown the dealer button is moved onto the next player and the next hand is ready to start. When a player has put all his remaining chips into one pot during a hand he is considered “all in“. This can happen in any of the betting rounds. A player who is All In can take no further part in any betting rounds (as he has no chips left). However if there are still two or more players left in the hand with more chips in front of them then they can continue to bet during the subsequent betting rounds. Because the All In player has not matched these subsequent bets he is not entitled to win them so they are placed into a separate “side pot” which only the other players can win. If a player is all in and there is only one other player left with chips in the hand then he has no one else to bet with and there can be no further betting. In this situation there is no side pot and the hole cards are revealed and the final community cards are dealt to determine the winner. Texas Holdem is the most popular poker game for a reason. It is simple to learn, but can be a very strategic game so it allows plenty of room for improvement. We recommend that you now visit our Play Poker section and get started playing Texas Holdem at an online poker site. Practise is the best way to learn, so pick a low value stakes Texas Holdem table and just experiment until you get used to all the stages above. Once you are comfortable with how to play Texas Holdem then the next stage is for you to learn how to play well and make sure you are a profitable poker player. We have you covered there as well so head on over to our Poker Tips section and start counting the profits – and the best bit is we don’t charge you a commission on your winnings, you get to keep them all!